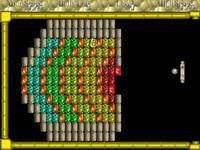 Krakout - download Arkanoid game. 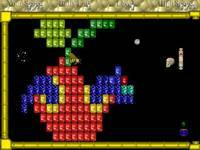 Arkanoid download. Did you ever wonder why some remakes make it to MTV's Top20, while others fail? It's simple - the good ones contain the soul and the vibe of the original. The bad ones don't. It's time to get acquainted with KRAKOUT - the top of the chart remake of good old classic arkanoid game. The game is overflowing with the spirit of the original. It's dynamic, action packed, fast, addictive, adrenaline filled and graphic rich. This arkanoid game deserves a standing ovation. The pad, the ball, the blocks, the monsters, the prizes - all of the arkanoid game components are superb. The gameplay and design are top notch. And best of all KRAKOUT adds a bit of new flavour to arkanoid game. You've got new weapons at your disposal. You've got monsters to shoot at to receive bonus points. There also are new types of bricks and prizes. In short, whether you are a teenager, student, parent or grandparent, you will instantly fall in love with this exciting game. And get prepared for "long term relationship" with this game, because new levels keep coming out regularly. KRAKOUT is free to try, which means you buy the arkanoid game only if you like it. So download it now as start playing KRAKOUT. 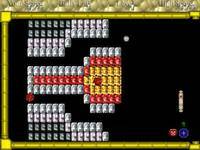 Spirit of original Breakout / Arkanoid game. Many amazing Episodes (you can download more Krakout Episodes). Increasing speed and difficulty level. Very fun gameplay as original Arkanoid / Breakout style game.